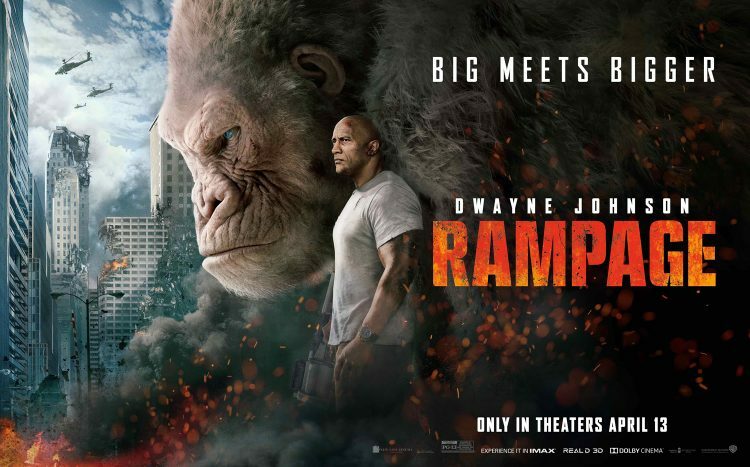 Brad Peyton returns to direct another Dwayne Johnson action vehicle, this time loosely inspired by the 1986 Midway arcade game, in which players controlled a trio of oversized creatures wreaking havoc on a city. Working backwards from this inevitable conclusion, we begin with contemporary fears about CRISPR being misused by cookie-cutter villains. Rampage is big, dumb fun when it’s let off the leash. Sadly that requires enduring a painful middle act that focuses on the uniformly uninteresting supporting characters. Johnson believably sells his relationship with George the gorilla, whose confusion at his own chemically-induced violent urges reflects to some degree the present crisis of masculinity. Which is somewhat ironic given that the movie is at its strongest when letting us cheer gleefully as the creatures lay waste to a hilariously ineffective military assault.